If you’re looking for an Abraham Lincoln costume for a class project, a reenactment or even for a Halloween costume you have a few options to choose from. To get an easily recognizable and/or historically accurate costume, you should base your costume on a famous image of Abraham Lincoln or on an item of clothing Lincoln often wore. 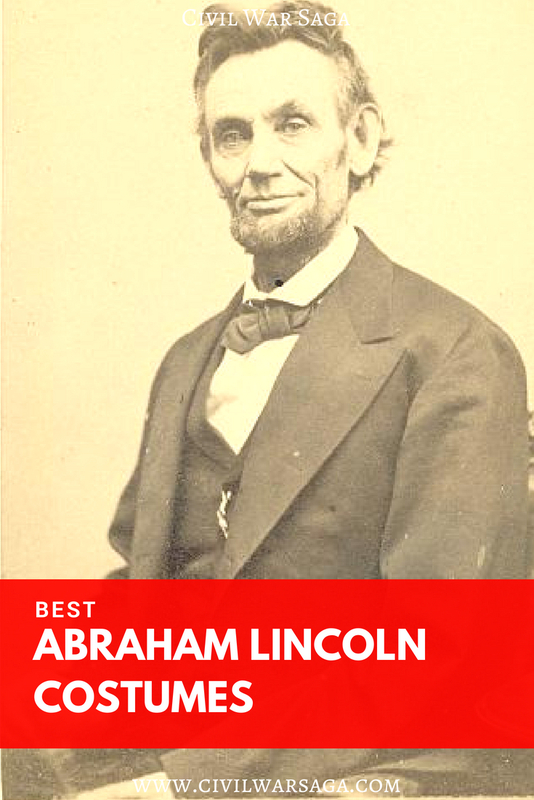 Fortunately, there were many photographs of Abraham Lincoln taken during his lifetime and as a public figure, his clothing and appearance was thoroughly noted. In this photo, Lincoln is wearing his trademark “office suit” which consisted of a black double-breasted broadcloth coat, a black single-breasted vest, a dark diamond tip bow tie and his famous stovepipe top hat. The adult costume that I found that most closely resembles this photo of Abraham Lincoln is this Abraham Lincoln adult costume by Forum Novelties on Amazon. This costume is the best-selling adult Lincoln costume on Amazon. The costume is made of polyester and comes with a stovepipe hat, beard, black coat with an attached shirt front and silver vest and a black bow tie. The pants are not included. The costume isn’t an exact match of Lincoln’s trademark office suit because Lincoln only wore black vests and was never photographed or even seen wearing a silver vest, but it is close enough that it serves its purpose. The listing says the costume is based on Lincoln’s appearance on the white marble Lincoln memorial that was carved by Daniel Chester French, which I guess possibly explains why the costume has a light-colored vest rather than a black vest. The costume is a standard, one-size fits all and has decent reviews on Amazon but many reviewers have noted that it runs a bit small and is better suited to fit a teen or small adult. There are also a few complaints that the beard doesn’t stick well and the hat is a bit floppy but can be fixed by stuffing it with newspaper. This Abraham Lincoln child costume by Rubie’s is one of the best-selling kids Abraham Lincoln costumes on Amazon and also one of the most historically accurate. The costume is made out of polyester and includes a black coat, a black vest with an attached dickie, a black bow tie and a black hat. The beard and pants are not included. The costume matches Lincoln’s trademark office suit perfectly, except perhaps the tie which is a little long for a bow tie. The costume comes in three child sizes, small (2 to 4), medium (6 to 8) and large (10 to 12) and has great reviews on Amazon with many reviewers noting how surprised they were by the great quality of the costume. If you already have a partial Abraham Lincoln Costume and only need certain accessories to complete it, you can always buy them separately. This Abraham Lincoln Instant Disguise Kit by Forum Novelties contains an Abraham Lincoln hat and beard. 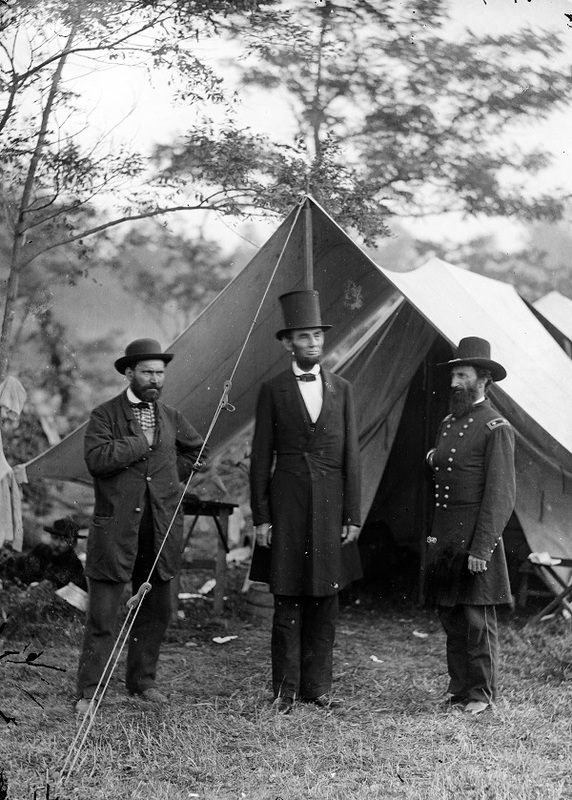 The hat is made out of polyester and measures nine inches tall, which is an inch or so taller than Lincoln’s actual stovepipe top hat. The beard is made out of a synthetic material that comes with two to three pieces of double-sided tape to help it stick to your face. The kit comes in a standard, one-size fits all. The kit has good reviews on Amazon with many reviewers noting that it is perfect for class projects and Halloween costumes. If you only need a stovepipe top hat for your costume, this Abraham Lincoln stovepipe hat by the Jacobson Hat Company is a great choice. The hat is made of black felt and measures eight inches tall which is the same exact height of the actual stovepipe top hat Lincoln wore to Ford’s Theater the night he was assassinated. The hat is available in a standard one-size-fits-all. The listing says the hat will fit most teens and young adults. If you only need an Abraham Lincoln beard to complete your costume, this Abraham Lincoln Fake Beard with Strap by Americana is the perfect choice for you. The beard comes with a strap, instead of the flimsy double-sided tape other fake beards come with, which goes around the back of the head to keep the beard on. This makes the fake beard more durable and a lot easier to wear. The beard has great reviews and a 4.5 star rating on Amazon. This Abraham Lincoln mask and hat by Forum Novelties is a great addition to an Abraham Lincoln costume or a great stand alone costume in itself. The mask is made out of latex and comes with an attached felt stovepipe top hat. The mask has good reviews although a number of reviewers noted that it smells very strongly of rubber and, like most masks, it is a bit stuffy when wearing it, which makes it difficult to wear for more than a few hours at a time.